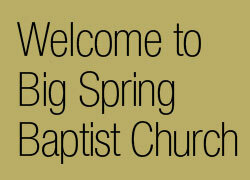 The Woman's Ministry of Big Spring Baptist Church is here to provide activities and ministry opportunities that will help you on your Christian journey. We want to see women living the abundant life that Jesus called us to. This ministry exists to serve you and to provide a place of service for you.